Kettlebell training is one of my favorite tools in the trainer toolbox. Kettlebells are versatile and great for strength as well as conditioning. And, women tend to become fluent in the movements very quickly. Most people have already experienced kettlebells, so I won’t go into too much detail about the benefits. All you need to know is that they are awesome, because they hit every major muscle, recruit your core like crazy and help ladies get amazingly strong in a short amount of time. Today, I wanted to share with you a great kettlebell conditioning finisher that you can tack on to the end of your strength training session for a final muscle/calorie burn. I did this one last Sunday after a heavy full body training day. First let me share the FULL BODY Training Session that PRECEDED the finisher. I didn’t do a lot of volume—rather, the focus was shorter rest between these big movements. At the end of this session, I grabbed my 16kg kettlebell and got to work. This was a bit lighter weight than what I typically recommend, but after having some elbow pain, I decided training smart was a good idea. Typically, I’ll use 20kg or 24kg and recommend between 14kg and 20kg for my training clients. 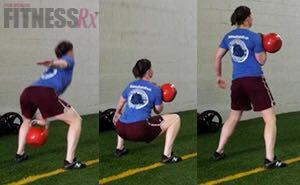 The object of this kettlebell conditioning clean is to perform all the repetitions on the right. Then, switch to the left in one motion and complete all of the reps to the left. You should complete three different cycles of repetitions. Reps will decrease with each cycle. For the front squat, you want to drop down into a deep squat. Having the weight set on one side of your body will require you to brace your core and really drive up through your heels on each rep. Perform this cycle one time as a short and intense conditioning finisher. Check out a video below and be sure to leave a quick comment about how this cycle went for you.